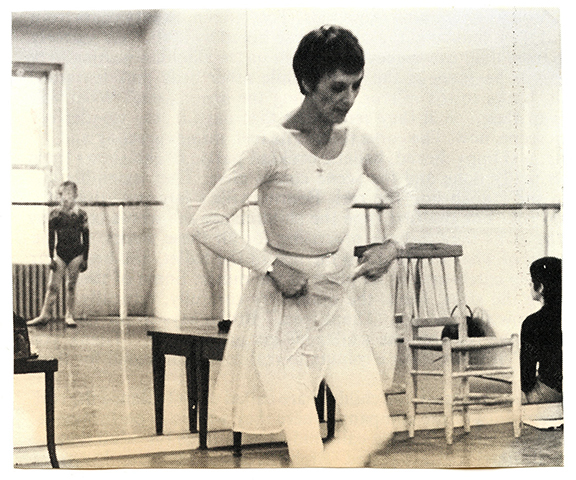 Last month, I read of the passing of a favorite ballet teacher, Nansi Clement. I am so overwhelmed with emotion when I remember what it meant to me to be in her classes, in her presence, and under the roof of that amazing building at 3 West 61st Street, which then housed American Ballet Theatre and its school, and was razed over thirty years ago. I was so deeply ignorant of ballet when I first stepped out of the old elevator and walked into ABT’s lobby at age 17 to take one of Miss Clement’s open classes. I had no idea of the history that was surrounding me and that was being made in the studios adjacent to her Adult Beginner classes. I had no way of knowing that I was in the earliest moments of what would become a life long love affair with ballet, an art that would so enrich my life and make my heart ache with its beauty. It was there that I went on to learn the basics of ballet, to hear melodies from the great ballets played on piano by live accompanists in the studio, to meet so many fascinating people, and to learn how to dress and carry myself, as I fell under the inspiration of Miss Clement. She never acted benighted about teaching a class full of adults who only wanted to learn the art for its own sake. We were hobbyists. Some of us may have been passionate hobbyists, but we were hobbyists just the same. We didn’t have the bodies, we didn’t have the feet, we didn’t have the early training and we had no potential of ever turning pro. Yet she showed us such respect, took us seriously, made us laugh, challenged us, gave us beautiful choreography and was generous in giving corrections. I took six classes a week with her, and looked forward to each one. In my freshman year at CCNY, it had been my habit to show up at large lecture classes which were given in the evening and stay just long enough to be marked in attendance. When the lights went down for the lecture and slide show, that was my cue to steal out of the hall and jump on to the D train to Columbus Circle so that I could take Miss Clement’s class instead. Sending along my best wishes to the loved ones who survive her, and to all of us who took class with her somewhere along the way. Gosh. She was just such a wonderful teacher. I still carry her love of ballet in my heart and it wells up from time to time when I least expect it. These are photos that I cut out of Dance Magazine sometime around 1980. Wish I could credit the photographer, but I don’t have the name. 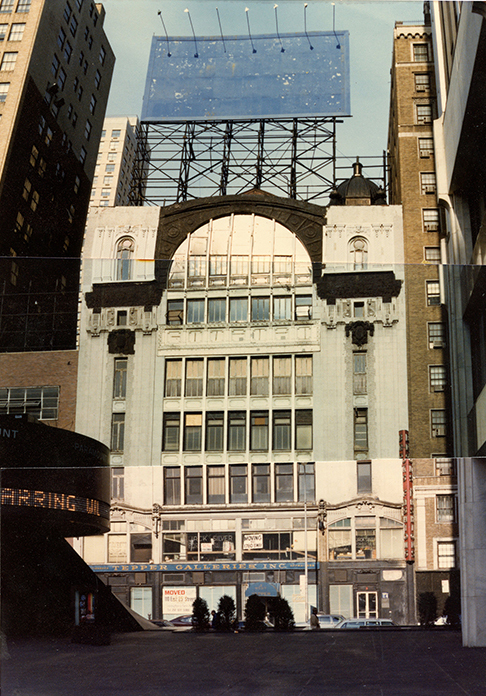 The last image is a collage of photos of the late 3 West 61st Street. I took these pictures when I heard the building was going to be razed. You can see the big MOVING banners in the windows near the street floor. ABT occupied the top two floors. You can see the interiors in the 1977 film The Turning Point. 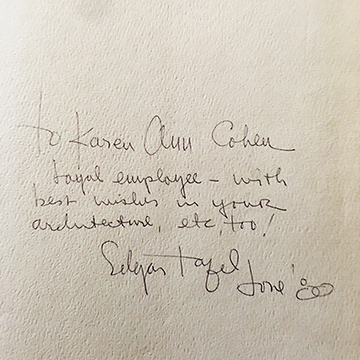 A friend from architecture school was suddenly interested when he found out that I was working as a draftsman for Edgar Tafel, one of Frank Lloyd Wright’s original apprentices at Taliesin. He’d overheard me describing how much I enjoyed a little office ritual that Edgar practiced a few times each month, when trade magazines arrived in the mail. Back then, circa 1980, these were thick glossy paper magazines packed with colorful photos, interviews, editorials and advertisements. Progressive Architecture. Abitare. Architectural Record. On rare occasions, Architectural Digest would put in an appearance. But the manly men in the office weren’t the target demographic for what they referred to as “Architectural Gourmet”, being that it was a newsstand magazine selling glamour, and not a nuts and bolts trade publication illustrated with wall sections and working drawings. These were the later years of Edgar’s architectural practice. I joined his staff in 1980. He was 68. 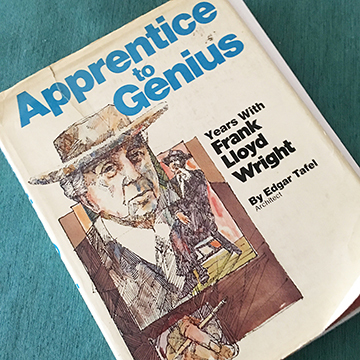 His first book, Apprentice to Genius, had been published, and he was traveling the world on the lecture circuit, sharing his wonderful stories of Mr. Wright. He’d already closed down his big office and reduced his staff to five of us. Edgar, our interior designer and our bookkeeper occupied the sunny front room of the garden apartment in his gorgeous Greenwich Village townhouse at 14 East 11th Street in New York City. When a trade magazine was delivered to the office, Edgar would collect it, and visit those of us who worked in the back room – two RAs, Geoff Paine and Al Karman, and me — 22 years old and fresh out of college. I spent my days drafting by hand with a mechanical pencil on mylar. There was a beautiful view outside my window, of the house’s rear garden with its flagstone patio and planters spilling over with ivy. Edgar would hold court, placing the newly arrived magazine atop a stack of well worn blue line prints, piled on an oversized drawing board opposite the office flat files. He’d invite us to join him as he went, page by page, through the issue. If a magazine had a photo of a house that piqued his interest, he’d improvise a presentation. His index finger would skate along the roof line, and he’d sing out a note that rose in pitch as it moved up the ridge, growing lower pitched as it skimmed back down to the eaves. He’d roll his tongue to vocalize sounds which mimicked the facade’s texture. If there were articulated joints along the facade, he’d make a sound kind of like a jack hammer, as his finger rapidly drummed against the connections. Or he’d tap his fingertip over a row of windows, singing staccato notes over narrow windows, and longer notes over wide windows. “Baaah – bah – bah – b-b-bah – bah”. It was as if he was reading a rhythm exercise on a staff of sheet music. Edgar’s experience of architecture was such that it could affect every one of his senses. He saw and felt so much beyond the four walls of any room that he visited or designed. I’d certainly never studied with or worked for anyone who appreciated the subject as thoroughly as Edgar did. He rarely expressed admiration for the Post Modern fashions of the day. 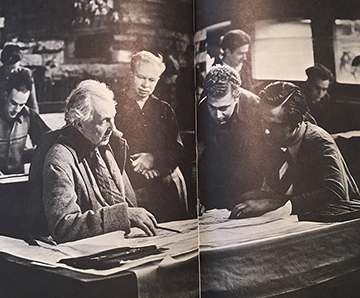 They just weren’t for him, a man who had spent the first ten years of his career at Taliesin, working on Fallingwater, the Johnson Wax Building and a host of private residents designed by Mr. Wright. From his youngest days, he’d sought excitement and change and risk taking in architecture. He’d written gleefully about the early days of the Chicago School, and its architects (Mr. Wright’s master Louis Sullivan among them) whose work and attitudes bucked popular trends and styles so that they could create their own, especially in the form of the high rise building, which was in its infancy then. Edgar lamented that this fell apart circa 1893 when the World’s Columbian Exposition anchored tastes and styles firmly back in Europe and the Beaux Arts for decades to come. And in his own right, he’d so artfully blended Gothic church architecture with Mid-Century Contemporary design in one of my favorite New York City buildings, the Church House of First Presbyterian in Greenwich Village. During his reviews of the trade pubs, Edgar also had a great eye for catching errors that might have slipped past a magazine’s editor. One day, he delivered a dramatic reading of an over-the-top letter of complaint excoriating the powers-that-be at the magazine for having published so many egregious errors in a past article on a specific era in architectural history. Its author claimed to be an authority on this era. He delighted in telling us the name of the person who had authored this letter of complaint. Which in Yiddish, translates into Horse S*** Eater. The punchline must have gone right over the heads of the vast majority of the magazine’s readership. But a punchline could not get past Edgar. I once heard Edgar Tafel referred to as a bon vivant, and I felt that was the perfect description of him. He seemed to take pleasure and find something humorous or joyous in even the smallest things. He just seemed so entranced with life, and so happy to be alive. A river of colorful friends continuously came through the office to visit. Edgar kept a packed social calendar, and would often start the business day by joining us in the back room to regale us with reports of where he had been the night before and whom he had seen and what had happened. The stories could grow into staged re-enactments, as happened when he once told us of a dance he attended. While swaying with an imaginary partner, he talked about encountering a rival dancing alongside him. He recounted how they traded barbs and insults throughout the evening without missing a step of the dance. He so loved a good laugh. One day, out of the blue, he took up a blank sheet of paper. He quickly sketched an elevation of the facade of the simplest, most non-descript one family house. The cartoon was about the size of a couple of postage stamps. Then he proceeded to repeat the sketch, over and over again, with slight alterations each time, claiming that these were “homages” to the work of the greats, as he imagined the way that each popular architect would visualize it. Mr. Wright’s would have a cantilevered roof. Corbu’s would be up on pilotis – reinforced concrete stilts. Phillip Johnson’s had the little Chippendale cut out at the top, in honor of his AT&T Building which was under construction at the time. Mies’ would be a glass and steel grid. Paul Rudolph’s had towers on its corners, bearing resemblance to the Yale Art and Architecture Building. Luis Barrigan’s was a stark concrete form, a stair without a railing, and a horse posed in front of it. This paper was passed around the office for months, as each one of us, and every visiting colleague of Edgar’s, was invited to add another cartoon or an embellishment to the collection. It grew to three pages and Edgar delighted in presenting it to visitors at the office. Another wonderful collection in the office was his George Washington memorabilia, which covered the walls of a short corridor outside the office bathroom. His friends, colleagues and clients got into the spirit of the collection, and always brought him new pieces to add. There were postcards, art prints, banners. Nothing was too kitsch to take its place in the makeshift gallery. Edgar knew how to curate and present it as if it was high art. While trying to recall all the details of Edgar’s apartment on the parlor floor, I couldn’t be quite sure if I’d got it right. I could remember the open Wright-ian floor plan, the beautiful grand piano and the profusion of Japanese prints. Other than that, my memories are hazy – I wasn’t up there very often. So I took my chances and ran a search to see if any interior shots had ever been posted. I came across a lucky find – a feature in the September 1954 issue of House Beautiful, showing detailed photos of Edgar’s design. When I first arrived in 1980, the parlor floor still looked nearly the same as it does in the House Beautiful spread. On the bottom of the second page, there is a photo of the back room on the garden floor. When it was transformed into Edgar’s office, that’s where I worked. Edgar did not share Mr. Wright’s dislike of paint. Though he did leave an exposed brick wall inside the apartment, the building’s brick facade was painted a powerful pine green, which looked fantastic with the black window frames, and the polished brass plaque outside the door which bore the words “Edgar Tafel, Architect”. Sadly, a visit to Google Maps Street View confirms that the facade of 14 East 11th Street was steam cleaned and that its interior was nearly gutted and rebuilt. Edgar’s leadership created such a wonderful and warm feeling of camaraderie among the employees. In the four years that I worked in his office, I only ever heard him raise his voice once or twice, and it was always to someone on the phone, never to one of us employees or to the contractors. My superiors were so incredibly kind to me, much more so than at any other office I’d every worked in, architectural or otherwise. Being that I worked for Edgar in the early 1980s, like every artistic kid, I played in a new wave/punk band after hours. Whenever Edgar saw my guitar around the office, he always referred to it as my machine gun. I was so touched when he actually came down to s.n.a.f.u., a club in Chelsea, to see me perform very noisy music with a very noisy band. It was a Tuesday night, the place was empty and we went on so late, but there was Edgar, with one of the female clients as his guest, and he was going to have a fine time whether our guitars were out of tune or not. I remember Al Karman as being endlessly patient with me, as well as being an unending source of brilliant one liners. He was so quick. A day didn’t go by without him making me laugh. He knew the names of the receptionists and administrative staff at every contractor’s office and always took the time to chat with them. While putting together construction documents, going through Sweets Catalog and making endless phone calls to manufacturers, he’d never get directly to the business at hand when his call was answered. He always humanized the exchange, asking what part of the country he’d just called, and what the weather was like. It was such a pleasure to work with him. Al left to open his own office about a year or so after I met him. So I spent the bulk of my time taking instruction from Geoff Paine. Geoff was reserved, with an incredibly sharp eye. He was referred to as the office “nit picker”, which was good for me, because his corrections really helped me up my game. Throughout the rest of my career, it was his standard that I always tried to match, and his voice that I always heard in my head, holding me to that standard. We also shared a great love for the ballet, and it was fun to gossip with him about the goings on at the big companies based in New York City. Long after I left Edgar’s office, Geoff and I still kept in touch with the yearly exchange of Christmas cards. 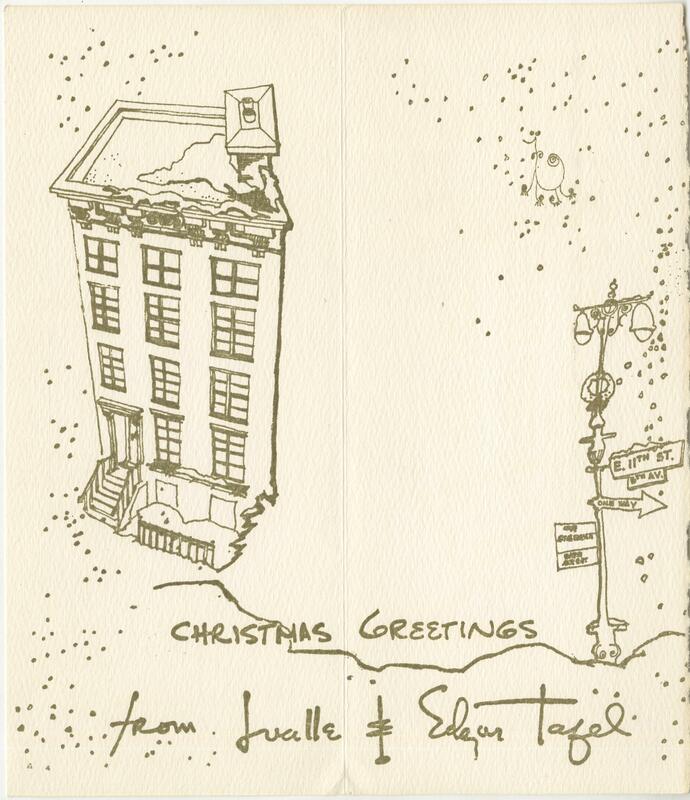 His cards always included an ample personal note, hand written in his impeccable architect’s lettering. Edgar also designed and sent out Christmas cards. In the 1980s, they were always printed in Cherokee Red ink on beautiful ivory stock. You can see the design of an earlier card here. I was so damn young when I worked for Edgar. I just cringe when I think back on some of the naive things I said and stupid mistakes I made in those days, at the very beginning or my architecture career. But then I don’t feel so bad about it, remembering that Edgar once told me about a certain building he’d worked on early in his own career, and how he was willing to walk a quarter mile out of his way to avoid seeing it and being faced with his rookie mistakes. Long after I left Edgar’s office, I received sporadic phone calls from him. They always came when he’d heard a new joke with a punchline that could only be appreciated by a Jewish person. I was always so happy to hear from him. Even though he lived to be 99 years old, I was saddened when a Google alert announced his death in January 2011. A few years later, Geoff Paine passed. I was surprised by how bereft I felt. The five years that I spent in that office left such an enormous impression upon me, and I still think of Edgar and Geoff, all these years later. The above is an excerpt from the program note from the show’s playbill. The note is so thoughtful and so beautifully written that it gave me plenty to consider before the house lights even went down. Take Dance marks their 10th Anniversary by presenting There and Here, which explores the process of life and the nature of the afterlife through a series of physical stories, many of which seem abstract while still woven together by an elusive narrative. We wonder if we’re seeing many aspects of one human’s transition. Or are we seeing their memories and experiences merge with the earth? The sets and the lighting are so striking while being so elemental. They created an atmosphere that felt sacred. The stage is covered with sand. There is a small hill tucked in a remote corner, and a few large stones are scattered around the periphery. Composer and musician Kato Hidecki is stationed at a drum kit and the equivalent of a small electronic sound studio behind a scrim . He provides an earthy, primal live accompaniment to the dance, a canvas of percussion and electronic sounds that conjure the spirit of the natural world. There are heartbeats, bird songs, ocean sounds, sounds of the wind, buzzing which reminds me of insects. The dance opens with the sound of something rumbling deep in the distance. 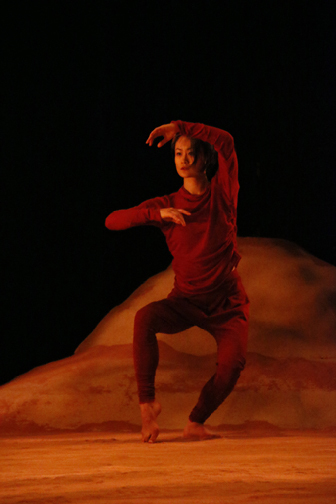 The stage is dark as a single dancer, dressed in crimson against the sand colored set, lies on her back. She moves so slowly, in such tiny increments, like evolution itself. She gradually lifts her head and shoulders. Her limbs rise in an unaccustomed fashion, till she’s left on her back with her legs reaching toward the sky, looking almost like the limbs of a tree. This pose is recalled to beautiful effect throughout the evening. In the opening, and in several other passages throughout the dance, there are no hard edges and very few angles to the forms of the choreography and the movement of the dancers. Muscles, torsos and limbs appear slack. Even in difficult balances, grande rondes and strong contractions, the body never seems rigid or controlled. The movement and shapes of the work seem to take their cues from the diversity of the natural world rather than from the brain and a set of techniques. I found this to be very affecting and it set a lovely tone to the piece. At times, sand rains down from above. Sand also slips through the hands of the dancers. It covers them as they roll on the stage, then it catches the light as it scatters to create gorgeous imagery. This piece also seems to emphasize the community that exists among people and nature. As one dancer moves along a line made of the stones, each dancer she passes extends a hand to help her balance. At times the dancers hold hands and seem to move as one being in a chain reaction. There are the muscular, athletic and daring passages too, with the fast paced and expansive partnering sequences that bear Take’s trademark. At one point, the women fly across the stage and hurtle themselves into the arms of their partners, which reminds me of the famous sequence in Paul Taylor’s Esplanade. This is a company of multi-faceted dancers who seem unafraid to take risks. In recent years I’ve seen them put through their paces in dances that range from the celebratory, to the heartbreaking, to the comical, to the lovely, to the abstract and beyond. Still, every passage of the choreography of There and Here has its own unique voice, and it seems to reveal a new aspect of the dancers as individuals and of the company as a whole. 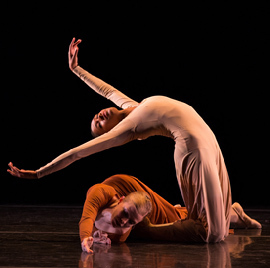 The closing moments of this piece are especially moving, as the dancers slowly travel in a circle around the periphery of the stage, each one either carrying a stone or letting the sand slip through their fingers. There is little uniformity to the movement, yet it works so beautifully as a cohesive whole. Beginning in the darkness, in an atmosphere of quiet ceremony, then gradually building over the course of the evening into an explosion of power that rocked the opera house, Kodo delivered a sensational performance at BAM on Friday night. 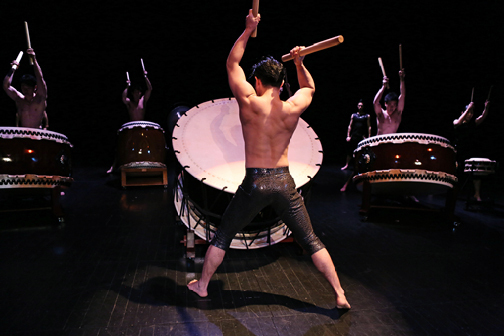 At the heart of their show is the ancient and sacred art of the taiko drum of Japan, drums that are used at festivals in prayer to summon the Gods. Steeped in this tradition, Artistic Director Tamasaburo Bando and Kodo’s ensemble of fourteen men and women drum, sing and dance in styles that range from the deeply spiritual, to the hilarious, to the exhilarating. But even as the artists amped up the excitement to the level of a rock concert, they never seemed to stray from their traditional roots. In the program notes, Producer Nobuyuki Nishimura speaks about the challenge of presenting ancient and sacred Japanese folk arts on theatre stages in foreign countries to audiences who are unfamiliar with them. I would imagine that some would argue that it shouldn’t even be attempted. There was one Japanese speaking commentor on BAM’s blog who complained that the presentation was too commercial. But I felt that Kodo managed to communicate beautifully with the American audience without compromising the sanctity of their art. As their energy intensified throughout the course of the evening and brought the audience to their feet, I felt as if the we experienced and respected the sacred within the exhilaration. Even as the complete ensemble displays their precision and virtuosity, they do it while stepping around the stage in a circle, each player humbly backing away as if to offer the spotlight to the person next to them. It seemed to emphasize the unity of the group and an unbroken circle of tradition. Bando’s program notes read like poetry, suggesting that those in the audience embrace the mystery of darkness. Indeed, the concert begins on a darkened stage. Drummers in black costume emerge. A dot of white light hovers over each of their heads and blue light beams from each foot. They remind me of fireflies. Their movement often takes its lead from the rhythm of the drum, and seems to embody the energy of the natural world. I felt as if I was in a dense woodland, catching glimpses in the distance of graceful animals, birds or insects that I’d never seen before. As far as I could tell, all of the instruments were crafted from natural materials and this enhanced the earthy atmosphere of the performance. The physicality of the drumming is seamlessly transformed into choreographed dance. In one sequence, three large drums are stationed around a very large central drum. Three men circle the central drum as they play, shifting their playing from the central drum to the satellite drums, leaping with primal energy into barrel turns as they travel from one drum to the next. The drumsticks become extensions of the hands, creating images of wings or tree branches. In another sequence, a trio of women encounter and appease a trio of hairy masked beings. They tell their story in staccato movements, with emphasis on the arms and hands. They are so lovely, and they draw us into their narrative, making us laugh. Dancers and players sometimes seem to drift from one station in the formation to another, as if they are propelled by the music rather than executing steps. They move without any hint of pretense. There is a beautiful and inspiring humility to their showmanship. The variety of drums used seems limitless. There are drums on the floor, drums strapped to the body, drums held in the hands, drums whose barrels are different lengths and make different sounds, drums with different voices and pitches. They come together with bells, flutes and vocal harmonies which are beautifully layered into the music. At times, there are rapid shifts in dynamics or tempo but all of the movement remains flawlessly synchronized and we are awed by the virtuosity and precision of the players and the dance. The audience cheered wildly throughout the performance. There were standing ovations and a rush of enthusiasm in the crowd as we left the theatre. The performance had been so exciting and so moving that it made me wish I’d brought a host of friends to experience the dazzling beauty along with me. 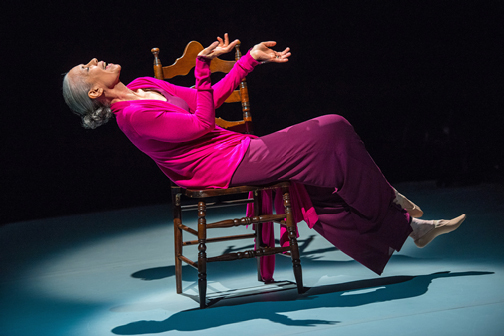 As I Remember It is a celebration of a life given to the arts, as told by Carmen de Lavallade. 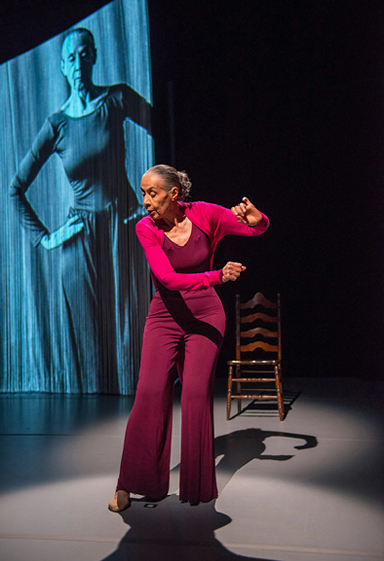 To see her, telling her life story, looking willowy, strong and gorgeous at age 83, moving with grace and purpose, performing this hour long one woman show, is to be inspired. One refrain from the show has Ms. de Lavallade saying “Everything with a purpose,” before she inventories the details of movement that make up a dancer’s work. As she dances, we can see the results of a lifetime spent paying attention to every small detail while still delivering the overarching emotion of each phrase. We can also see the spectrum of expression that can be achieved when a dancer is also an actress. The bare stage is set with an asymmetrical frame from which hangs material resembling white silk strands. The network of strands becomes the projection screen or the curtain behind the proscenium arch. The strands can ripple to lovely effect, as if being blown by the wind. Ms. de Lavallade wears the clothes of the dance studio, a leotard, jazz pants and a magenta colored sweater with long ties. Throughout the evening the sweater becomes part of her movement. Though dance fans will devour this performance, I felt that it could be just as accessible to those who aren’t familiar with dance. It’s the story of a life well lived, and the humanity of the woman who lived it. The story is also set within the context of the American experience throughout the decades in which Ms. de Lavallade has lived and worked, including the struggle for civil rights, and the pressures brought to bear on artists during the Red Scare. She recreates her childhood in East LA by listing the fragrances of flowers and citrus fruits that grew there. She recreates wisps of childhood dances that she and her sisters acted out to accompany their favorite radio programs. She speaks of her grandmother and each one of her aunts by citing something special about them — with just one well crafted phrase we begin to get a feel for who they were, from artists and educators to activists. She speaks with great affection about her father, who worked as a master bricklayer and who raised all of the food that the family ate. When she came of age, she found that her prospects were limited because very few companies would even consider hiring a black dancer. She was hired by Lester Horton. Most modern dancers have taken class in Horton technique, but Ms. de Lavallade gives us living breathing insight into Lester Horton and his company. His company practiced on stage, not in a studio. There were no mirrors. They worked on complex stage sets and rehearsed getting around the stage with their eyes closed. The dancers were also expected to do chores. “Clean the bathrooms, sweep the floors.” They worked seven days a week. After carefully observing Bella Lewitsky, Lester Horton’s muse, in the role of Salome, Ms. de Lavallade was called upon to perform it at age eighteen. Horton encouraged her to dance the role in her own artistic voice. She reenacts how, on her opening night, she stepped through the curtain, only to have the tape with her music break. The Horton Company came to the 92nd Street Y in New York City, having crossed the country in a caravan of station wagons. In a wonderful sequence, Ms. de Lavallade re-enacts phrases of a dance, using the long tails of her sweater as a stretchy modern dance costume, wrapped around her head and shoulders. She peeks out at the audience from behind the fabric and her brow furrows. “The house is half empty!” With no advance publicity, the Horton Company’s season turns out to be a financial disaster for the company, who had to wire back to California for emergency funds just to get home. It is weeks later that the reviews appear, and the company wins critical acclaim. There is a lovely informality to her telling of the story. When she plants her foot on an ottoman and nearly misses, she just wags her finger at the thing and does it again, this time getting it right. When she forgets the name of someone in her story, she moans that it’s terrible to get old. Someone off stage feeds her the person’s name. It’s all done so easily and organically that we don’t know if she intended it that way or not. After Horton’s death, company member Alvin Ailey begins choreographing. They both wind up in the cast of the musical _House of Flowers_, along with Pearl Bailey, Arthur Mitchell and her future husband, Geoffrey Holder. It’s around this time that Ailey and Mitchell begin to form their own companies. She goes on to work with Ailey in a venture called the American Dance Company, but she receives top billing and this creates trouble. We’re shown a clip of the opening of a 1961 episode of The Ed Sullivan Show. At first I was so surprised. Had there really been dance of this caliber regularly shown on TV in this era? Though Ms. de Lavallade’s stories are riveting and left me longing to hear more, it was her charm, humor and her affection for the stories and the people she knew, that made the performance so memorable. She is a woman who achieved the heights of artistry, worked with a host of renowned artists, and made history along the way. On February 13th and 14th, Dance Iquail will be presenting a ballet titled Black Swan at the Ailey Citigroup Theater. Executive and Artistic Director Iquail Shaheed and Harlem Arts Alliance presented a powerful program of dance, talk, film and video, along with a panel discussion on the subject of the ongoing segregation, diminished resources and social disenfranchisement that still exists in the dance world in 2015. The evening went from strength to strength and left us with much to consider. 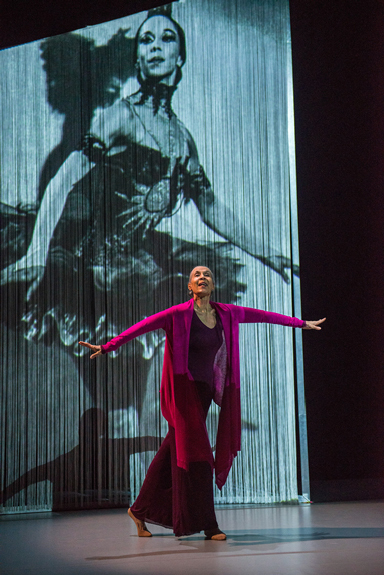 The program opened with a short excerpt from Carmen de Lavallade’s As I Remember It, a solo performance in which poignant movement, film, and storytelling weave an unforgettable memoir about her venerable life on stage. The full length show will be presented at the Baryshnikov Arts Center, February 19th – 25th. Producer Anna Glass referred to the event as “Carmen giving a master class on stage.” Ms. de Lavallade, who at 84 remains fit and beautiful, moving with grace and elegance, talked about her experiences with theater and dance, and how study and work in each discipline enhanced her abilities and expression in the other. Dance Iquail presented But Beautiful, an excerpt from Black Swan, choreographed by Iquail Shaheed with music by Nina Simone. I was impressed by the unique voice of the choreographer and the dance’s fresh approach to combining classical and modern movement. The dancers are barefoot, the women wearing black leotards and black tutus that are short in front and longer in the back. 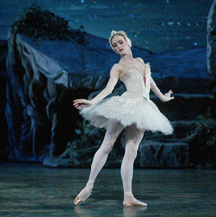 Several references are made to iconic ballets. The dancers stand still on the diagonal, their right arms raised, reminiscent of Balanchine’s _Serenade_. Then with what seems like telepathic timing, their arms softened with classical grace, and I couldn’t help but sigh at the power and the beauty of that little gesture. Four women take hands to form the line of the Cygnets from Swan Lake, and they execute the port de tete from the classic choreography. But their torsos contract and they peel off from the group, one by one, as if to display their individuality and to reject the conformity demanded of the present day classical ballerina in body shape and skin color. Dance Iquail’s mission is to use the art of dance as a conduit for combating issues of social injustice primarily experienced by the disadvantaged. This was expressed beautifully in the dance. This is the type of mission that I deliberately seek out in the arts. 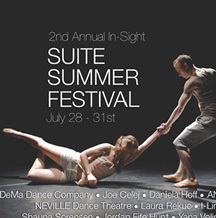 I look forward to seeing their evening length performance at Ailey and their future work. Panel discussions that pack the punch of Black Swan: Solidarity Beyond Colored Pointe Shoes are way too few in the dance world. Panelists included Karen KB Brown, former principal dancer with Dance Theatre of Harlem and Artistic Director of Oakland Ballet, Andrea Long-Naidu, who danced with New York City Ballet and Dance Theatre of Harlem, Iquail Shaheed, Zita Allen, dance writer, journalist and historian, and moderator Baraka Sele, former Assistant Vice President of Programming for the NJPAC Alternate Routes series. Recurring themes in the discussion included our generation’s awareness (or lack of awareness) of dance history, and what we’re passing on to the generation now coming up. Not just the performance highlights, but the struggles and resilience faced by black dancers in the context of racism and segregation in American history. Iquail Shaheed talked about the need for a community engagement campaign. This is so vitally important. We have to call things by their right name. Zita Allen, the first black critic for Dance Magazine, talked about her early ballet training in Austin, Texas, where she was only allowed to come to the studio if she came in through the back door, accompanied by eleven other students (and no fewer) after everyone else had already gone home. When one student quit, the rest of the group was no longer welcome. The story was told about the career of Raven Wilkinson, a light skinned black ballerina who was invited to join the Ballet Russes de Monte Carlo in the 1950’s, provided that audiences never found out that she was black. She was often made to wear white makeup on stage, to travel separately, and she was excluded from performing in certain towns in the American south. While the company was in Atlanta, word was leaked that there was a black dancer in the company. In response, the Ku Klux Klan sprang into action. 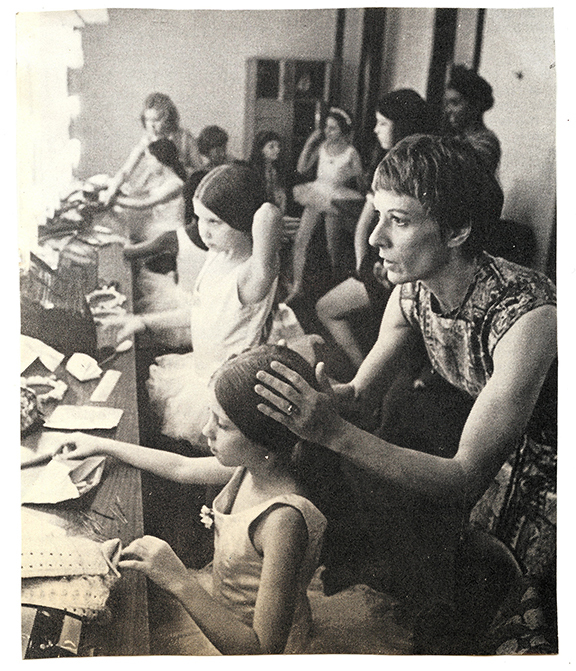 They barged into rehearsal, cornered Alicia Alonso, and demanded to know if she was the “n” in the company. Not all displays of racism are as blatant, but they are just as damaging. Alicia Graf would be told “you’re too tall” for a specific role. Josephine Baker had to become a caricature in order to draw an American audience, while in Paris she could be glamorous. It’s said that Balanchine wanted ballerinas to have skin the color of a peeled apple. Courtney Lavine and Aesha Ash were corps dancers who were never able to move up the company hierarchy. Iquail Shaheed overheard his teachers, while casting a ballet, saying of him that he needed to stay out of the sun. Baraka Sele pointed out that the demographics of ballet companies do not reflect the demographics of the country, yet the companies receive funding from, among other entities, the American government. Zita Allen echoed this, stressing the importance of understanding the historic context of favorite ballets. It enhances a dance fan’s appreciation of Revelations if she understands what was going on in America circa 1960. Ms. Allen encouraged young choreographers to care about the world that they are living in and to address the political in their works “even if it’s done obliquely”. Karen KB Brown talked about the absurdity of putting black ballerinas in pink tights and pink pointe shoes. This type of costuming cuts the look of the dark skinned ballerina in half. 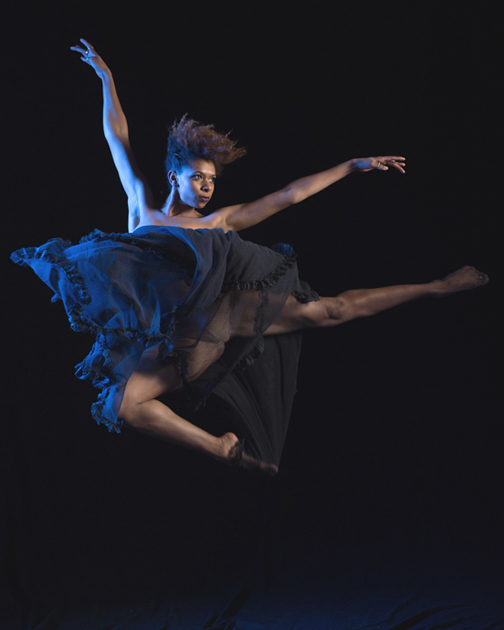 For choreographers and artistic directors who protest that they can’t use a black ballerina because she will stand out too much, Ms. Brown’s “solution oriented” advice was that they should hire more than one. Several of the panelists gave book recommendations. Books mentioned included The Black Dancing Body and Joan Myers Brown & the Audacious Hope of the Black Ballerina by Brenda Dixon Gottschild, The New Jim Crow by Michelle Alexander and The Autobiography of Malcolm X as told to Alex Haley. Andrea Long-Naidu advocated reading spiritual books, to help dancers develop the inner strength that they will need to progress in the dance world. Iquail Shaheed talked about sending his students to the web to research dance history. He recommended Jacob’s Pillow’s Interactive Web Site, where he was able to learn about the genesis of Creole Giselle. He put out a call for dancers to put their archives up online, where they’d be available to everyone. I loved this event. Those who made up the panel were so inspiring. They raised thoughtful questions, they taught me and they left me with a thirst to learn more. I’m hoping that there will be more talks like this to come, because they are sorely needed. The video below, Sun Moon Child with music by Imani Uzuri was shown at the end of the evening. Take a look. If you’re older, it will bring back great memories that might drive you to tears. If you’re young, it will school you. Of all the ballets that I’ve ever seen, Swan Lake remains my favorite. Having the opportunity to see the Mariinsky Ballet (formerly the Kirov) perform it in Brooklyn was nothing less than a privilege. This was a wonderful production from beginning to end. The technical excellence of the individual dancers was there, exactly matched by the precision of the company and the heart and soul brought to the lead roles by the principal dancers. The Mariinsky Orchestra, conducted by American born Gavriel Heine, combined with the acoustics of the old opera house, allowed me to hear voices and nuance in the music that I’d never heard before. In the role of Prince Siegfried, Timur Askerov is somewhat reserved. We don’t see big displays of emotion or childishness from him, but we do feel Siegfried’s love for Odette expressed through his dancing. He is regal and dazzling. Without the use of any overblown gestures, he was especially dramatic in the moment that he pledged to marry Odette. Vladislav Shumakov, in the role of the Joker, was a show stopper. He comes between the players at the party with good comic timing. He gets great height and hang time through a series of stunning and challenging jumps. Yana Selina, Nadezhda Batoeva, Filipp Stepin were notably lovely in the pas de trois. Andrei Yermakov made a dark and fascinating Rothbart, more creature than man. His commanding presence was menacing. Yekaterina Kondaurova, who danced the dual roles of Odette and Odile, kept me riveted and left me with new things to consider about this ballet. I loved the understated elegance and economy of her acting, and every gorgeous detail of her dancing. 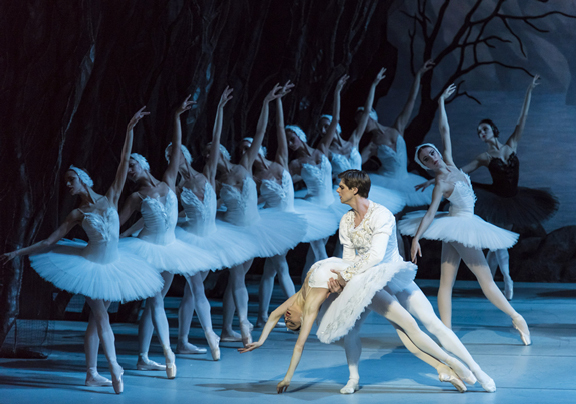 As Odette, she doesn’t display the customary nervous and desperate energy, yet we still feel such compassion for her. So much is made about the thirty-two fouette turns that must be executed by Odile in this ballet, but on reflection after having seen Ms. Kondaurova’s performance, I feel that Odette could be the more challenging role. She danced it with a sophistication that I’d never seen before. Mr. Askerov partners her masterfully. 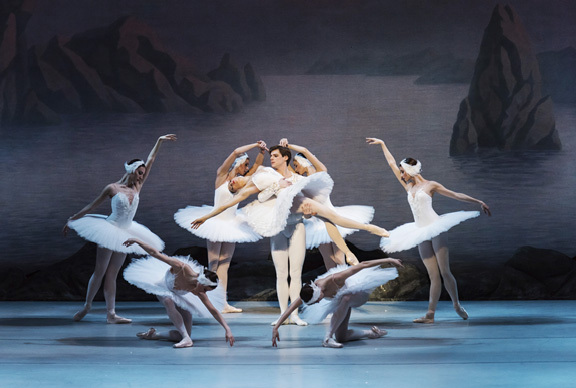 Toward the end of the lakeside scene, there is a protracted rest in the music in which the action on stage freezes as Ms. Kondaurov holds a pique attitude. This surprise worked to enhance the other-worldly atmosphere of the scene and to underscore the seriousness of the love shared by Siegfried and Odette. Early on in the Black Swan Pas de Deux, the stage lighting dims, magnifying the danger as Odile is casting her spell. It stays this way until the moment of truth, when the lighting returns to normal, intensifying the chaos that ensues. With every lift of her chin and every haughty glance, Ms. Kondaurova is captivating. As for the production in general, I found the lakeside sets to be especially enchanting. The swans truly move in the entrained fashion of a flock of birds. They seem to sense one another in a telepathic fashion and they move in unison with beautiful precision, as if they are of one mind. This was especially evident as the cygnets executed their crisp clean footwork. I found the divertissements in Act II to be among the best I’ve seen in terms of choreography and flair. I especially loved the stylish long reaches and the deep elongated side bends performed by Lyubov Kozharskaya and Anastasia Petushkova in the Spanish dance. This is a long ballet. With two intermissions and a prolonged third act, it runs over three hours. Yet the bows and curtain calls went on for quite a while, with howls and screams growing louder as they rose up from the balcony where we were sitting. This was a very special night in the theater and the audience knew it. I have to tip my hat to BAM. They always go the extra mile to enhance the audience’s experience. They e-mail ticket holders a few days before the performance, sending along links to interviews, articles and video to provide context for the ballet. This is much appreciated. Premiere Division’s Winter Show delivered well crafted performances of three story ballets choreographed by Artistic Director Nadege Hottier. The Little Match Girl was heart breaking in its beauty and sadness. Ms. Hottier’s choreography captures the isolation of poverty and exclusion against the backdrop of glamorous life in a big city. Players from The Bleecker Street Septet are lined up across the back of the stage as the dancers bring mid-twentieth century New York City to life, complete with gangsters and paper boys roving the street alongside Ziegfeld Girls dressed in lovely period costumes. The stage lighting, which is often on the dark side and sometimes done in sepia tones, enhances the atmosphere of a bygone era of the city. As each group dances, others remain on stage, posed like figures in a wax museum. The Ziegfeld Girls dance on pointe, but Ms. Hottier adds lovely jazz details, like an occasional dip into the hip, a flexed foot as a musical accent or finger snapping to the bassline. Mac Twining, Salim Ingram and Julian Watson provide strong solos. Their turns and leaps are powerful, but it’s their musicality that really impresses me. This has to be said of the entire company. I’ve rarely seen a group of dancers this young who are as sensitive to the music as they are to their technique. Kalliope Piersol, in the role of the Little Match Girl, gave one of the standout performances of the afternoon for me. She seemed so confident in her technique and the execution of the choreography that she was able to disappear into her role and conjure such compassion for her downtrodden character. She watches the glittering lives of the city’s characters from the sidelines. When she dances, she infuses each step with emotion. She reaches out, her hand tense with desperation. Her torso contracts as she hugs herself against the cold and we can feel the chill. She sails easily through turns which, along with her rose colored costume, seem to symbolize the strength of her dreams and her spirit, and her will to go on in spite of the hardships she endures. Her sadness and suffering stands out in sharp relief against the frolic of the characters she watches on the street. Finally ground down by her hard life, she sinks to the floor. Soprano Allison Clare sings Rachmaninoff’s mournful Vocalise as the Match Girl is visited by an angel dressed in black, danced by Kellyann Pintauro. Ms. Piersol and Ms. Pintauro dance together in solemn beauty, often in unison. Even though the story of this ballet is so sad, it is danced with such uncommon heart and sophistication, and staged with such style, that I’d love to see it again. Guest artist Alexandre Barranco plays the part of the Witch Mother Gothel in Rapunzel. Dressed in a sensational floor length black and gold gown with ram’s horns sprouting from his head, he alternately lurks and raises his chest like a sleek animal on guard. In the role of Rapunzel, Emily Abrom is angelic. A long legged ballerina dressed in white, wearing her long blonde hair loose, she enters the scene like a beam of ethereal light. Her adagio movement is regal and her developpes are luscious, unfurling till the very last tone of a phrase. The Adventurous Prince who courts her is danced by Mac Twining, a young man who moves with assuredness and exudes charisma. Their pas de deux begins with the two of them holding hands while standing back to back, which seems to captures the sweet and tentative movement of a new young love, as well as Rapunzel’s apprehension about retaliation from the Witch if she gives in to her heart. The Prince carries Rapunzel on his back, but soon enough she embraces him, even as the Witch looks on and eventually drives the two apart. Mr. Barranco is arresting as the Witch twists and plots and attempts to intervene and control the fate of the two young lovers. He moves slowly, wielding a sword with power and ferocity, and we fear it will be used as a weapon against the young ones. A defiant Rapunzel returns to the Prince and their love vanquishes the Witch, who writhes on the ground until she lays still. Ms. Hottier’s take on The Nutcracker is stylish, original, and full of risks given the familiarity that many ballet fans have with all the different Nutcracker choreography so heavily influenced by Marius Petipa and Lev Ivanov. Ms. Hottier’s Nutcracker also has the flavor of the mid-twentieth century city. The Housekeeper in the Party Scene, played by Kellyann Pintaruo, is adorable as she struggles to balance a stack of brightly wrapped Christmas presents to be placed alongside a diminutive tree. The guests are hilarious, moving in modern dress, low in plie, duck walking and thrusting their chins forward, changing focus with comical timing. The women look as if they’d stepped out of the pages of an old time issue of Vogue. 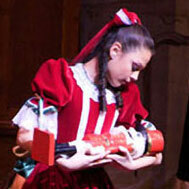 Clara, played by Kalliope Piersol , drifts off to sleep hugging the Nutcracker doll given to her by a Dandy, a guest at the party. She wakes to find herself with the Dandy, traveling through the Swirl of Snowflakes, and arriving at a Toy Store with a Machiavellian owner. Emily Abrom is all icy elegance in a white fur coat, dancing the role of The Lady Snow Queen with her Cavalier, Jacob Hiss. Wayfarers dance in raincoats and pop open their umbrellas while one lone Snowflake, Micayla Frank, lies on her stomach, facing the audience with a cute dreamy smile as she flutters her legs. The Toy Store scene features the variations that we all know and love, Spanish, Chinese, Marzipan, Arabian and Harlequin. The dancers are most entertaining and theatrical, and the costumes by Noriko Hara are magnificent. Alexandre Barranco is formidable as the Dandy, in a solo full of striking leaps and turns. His footwork is precise, silent and clean. Again, I am thrilled to see that his technique is matched by wonderful musicality. The Waltz of the Flowers is so far removed from any other version that I’ve ever seen. It is steep in technical demands, yet the dancers are up to it and appear to execute the dance effortlessly. Instead of being a big colorful production number, most of the movement is adagio. Kalliope Piersol’s Clara is girlish, innocent and lovely, even as she demonstrates great strength, performing challenging promenades, penches and long balances on pointe. She is expertly partnered by Mac Twining. I’m impressed with Premiere Division and I look forward to seeing future work from them. Founded in 2013, Premiere Division offers year round training and summer intensive programs for strong dedicated dancer, focused on high quality individualized training and an enriched stage experience. While the core training is rooted in strict European traditions, they also, by the means of in-program workshops, establish training in modern and contemporary techniques and styles. Their training emphasizes strength, endurance and precision. Artistic Director Nadege Hottier has trained in contemporary ballet with Maurice Bejart, and with neoclassical masters Valery Panov and Uwe Scholz. 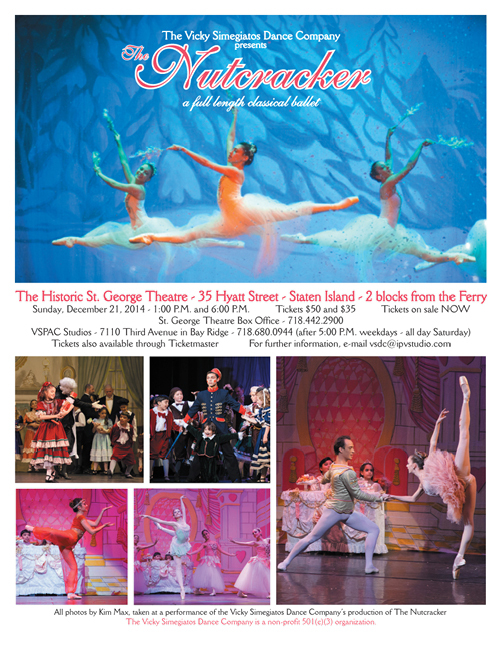 Sunday, December 21, 2014 – 1:00 P.M. and 6:00 P.M. 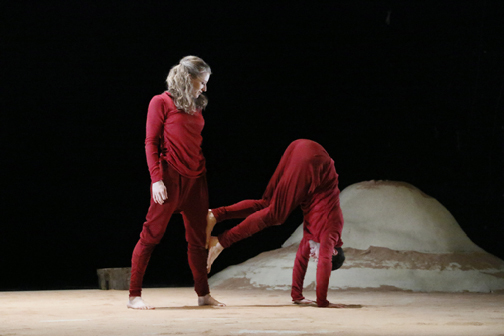 The Italian International Dance Festival presented an abbraccio dell’arte (embrace of art) featuring dance companies from Italy and New York which are directed by Italian artists. The festival’s Artistic Director Antonio Fini and Creative Director and host Tabata Caldironi presented a delightful program of folk dances, contemporary ballet, jazz and musical theater. Tarantella, opened with an intense solo danced by Fini, who also choreographed the piece. His tambourine rattles with passion and urgency as he sinks to his knees and arches his back. The program notes tell us that according to Southern Italian legend, the bite of a spider or the bite of love could kill a person. To rid yourself of the poison, you have to “dance, dance, dance and dance”. The tenth grade students of Talent Unlimited High School join Fini for a festive folk dance. Their hair is down and they are barefoot, dressed in swirling white skirts. The girls are fresh faced and smiling, the very image of young love. It was delightful to see the many ways that each one brought her own unique expression to the choreography. They seemed to tell so many different stories. Wonderful! Fini returned in Dancing with Noa, a very moving pas de deux danced with Noa Guy, a woman of sixty who’d been partially paralyzed in a car accident. 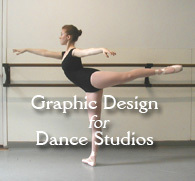 The piece employs creative movement in shifts of weight, floor work, gorgeous lifts and turns, and swooping falls. The dance captures what is universal in movement — it can still be so expressive, even when it comes in an unfamiliar or unpredictable fashion. The closing moments are especially dramatic — Ms. Guy is stock still, being held upside down by Fini, her long white hair fanned on the floor as her feet point toward the heavens. Michael Mao choreographed Song of Helena for students and dancers of Staten Island Ballet. It’s a lyrical contemporary piece, set to Gorecki’s Symphony of Sorrowful Songs, telling the story of a young woman in Poland incarcerated by the Gestapo during World War II. On the wall of her cell, she wrote a note to her mother telling her that that the Immaculate Queen of Heaven supported her, and that her mother needn’t cry. The dancers wear long white dresses. At times they seem like angels weaving through formations and encircling one central character. Or maybe they are fellow inmates collectively resigned to their fate. The ballet movement is haunting and lovely with expressive port de bras and luxurious unfolding extensions. The closing moments remind me of Balanchine’s Serenade. Instead of one girl arching toward heaven, the dancers rest on the floor as one walks into the distance, toward her fate. Antonio Fini wowed the audience with Gym-Me, a comic look at the antics of gym rats. Dressed in workout clothes down to the sweatband around his forehead, he trains fanatically, stretching, planking, doing crunches. He flexes and runs laps and makes a huge display of how hard he’s working. Then comes the posing, down to kissing his own biceps. Very entertaining. It was a thrill to see none other than Edward Villella appearing on stage to accept a Lifetime Achievement Award. 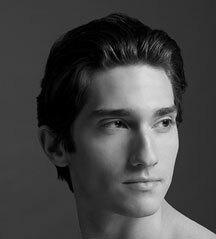 His list of accomplishments is dazzling, from his career as principal dancer with New York City Ballet, to Artistic Director of Eglevsky Ballet and Oklahoma City Ballet, to his founding of Miami City Ballet. At 78 he remains fit, handsome and charming. He received a standing ovation as Mr. Fini and Ms. Caldironi presented his award. 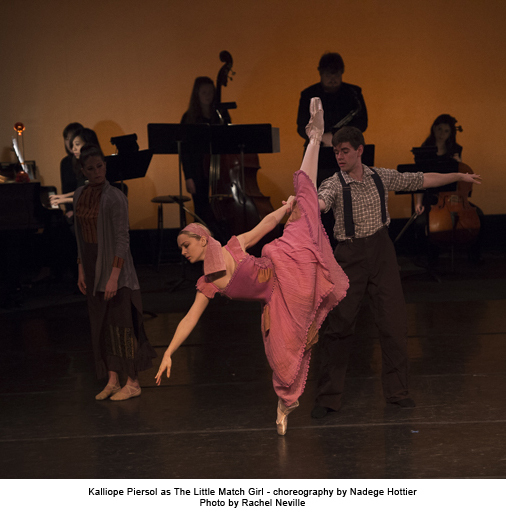 SLK Ballet performed Amaciza (Italian for ‘friendship’), choreographed by Sara Knight, to music by Inti-Illimani. It’s a jubilant ballet with a folk flavor, danced with hair down and bare feet. The dancers kick up their whirling white skirts and perform festive turns with their hands reaching skyward. This dance has a wonderfully joyous atmosphere and the dancers were just lovely. Dancer Alessandra Corona has something so special — you feel it from the first moments that she steps on to the stage. Antonio Fini partnered her in a romantic pas de deux from Dinner With Friends, Ms. Corona’s new production, which will open in Rome in November. She is riveting as her back arches and she ascends into a high lift. There is something girlish and innocent in her movement, along with a strong expression of passion. It was a pleasure to be introduced to her work. She was recipient of the Extraordinary Dancer Award from the festival. Jazz great Luigi was honored in Jazz Tango, performed in smooth style by Dianna Folio and Joey Doucette. Ms. Folio’s Homage to Luigi featured three electrifying young men. The dance begins by chronicling the exercises of the jazz class. As it opens up, we see travelling floor work that evolves into some iconic phrases from great old Hollywood films. The boys perform spectacular silent leaps. Their technique is so clean and they move with great flair. The evening closed with a musical theater performance — excerpts from a show that is about to open in Italy called La Sposa in Blu (The Blue Bride.) The show stars famous Italian drag queen Platinette, who comes home to find that her home has been burglarized. It was tough to follow the story, given that the entire production is in Italian, but the performance of the songs was quite rousing and Samantha Fantauzzi was especially captivating in the role of the neighbor. Platinette is a wonderful comic who later opened her arms, looked toward the sky and expressed gratitude to Joan Rivers. Bravo to Mr. Fini and Ms. Caldironi for bringing this evening of Italian culture to New York City. Mr. Fini’s Alto Jonio Dance is offering a Summer Intensive in Italy in 2015. Visit the festival’s web page for further information.